The New York Times Co. is cutting pay for most employees by 5 percent for a nine-month period and laying off 100 people. The company's flagship newspaper reported on its Web site Thursday that the cuts will hit most nonunion workers and run from April through December. Employees will receive 10 days off in return. The Times reported that union employees have been asked to take the cut voluntarily to avoid potential layoffs at the company, which has been struggling with an industrywide advertising downturn. Job cuts will come in the business operations of The New York Times, amounting to 5 percent of the total 2,000 workers in that part of the company. The Washington Post announced plans Thursday for another round of buyouts as it seeks to cut costs. 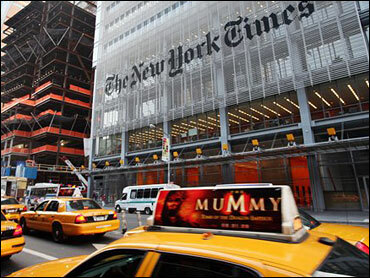 It is the fourth round of buyouts at the newspaper since 2003. About 230 employees, including famous names like Bob Woodward, David Broder and Tony Kornheiser, took the most recent buyout offered last year. The newsroom shrank in that round from about 800 workers to 700. In a memo to employees, Publisher Katharine Weymouth said buyouts are needed because revenue is dropping. As is the case throughout the industry, increases in online advertising are not making up for losses on the print side. "As we move forward, our path is pretty straightforward: we will have to reduce our cost structure," Weymouth wrote. In an interview, Weymouth declined to specify how many buyouts the paper is seeking. In her memo, she singled out a need to reduce jobs in the Springfield, Va., production unit associated with the paper's previously announced plan to close its College Park, Md., production plant and consolidate printing. The buyouts will also include the circulation departments and the newsroom, and a small number of advertising jobs and technology jobs. Weymouth said layoffs are possible if too few people volunteer for the buyouts. The Washington Post Co.'s newspaper division, which includes a few small papers in addition to the Post, brought in $800 million in revenue last year, but that was a 10 percent drop from 2007 and as a whole the papers had about $25 million in operating losses last year. But The Washington Post Co. remained profitable because half its revenue comes from a business unrelated to journalism - its Kaplan education unit. In a letter to shareholders dated Feb. 24, company Chairman and former Post Publisher Don Graham said the paper "will lose substantial money in 2009" and that he is willing to let it do so as long as it shows a plan to return to profitability. He noted that the paper carried the Kaplan unit throughout much of the 1990s when it was losing money. "Today it isn't obvious that even the best-run, most successful newspaper can be consistently profitable. But the Post will get every chance," Graham wrote. The Post Co.'s corporate structure, like that at The New York Times Co., keeps effective control of the company in the hands of the Graham family and has insulated the paper to some extent from Wall Street demands for even harsher cost-cutting measures that have been employed at some other newspaper chains. "We have a company that supports our mission and is willing to give us some time" to show a profit, Weymouth said. "We do have some cushion, and we're grateful to have that."